Our goals were outlined previously but I will summarize them very briefly right now. Spring, summer and fall testing and treatments as needed. Spring treatments included oxalic acid vaporization of the new packages and spring mite treatments with oxalic acid dribble. Summer treatment was oxalic acid dribble followed up with Mite Away Quick Strips when mite tests showed that it was required. Fall treatment was done with Mite Away Quick Strips and Apivar if mite counts were too high. As indicated by Jerry Hayes and Randy Oliver in their many articles on mite control, we try to have no more than 3 mites per 100 bees. One mite or no mites would be lovely but rarely possible! So, we set our goal to be under 3 mites per 100. When we purchased new replacement bees for our dead outs, we vaporized all of them. I have heard from many sources that beekeepers believe that mites are only on bees that are inside a hive. It is thought that package bees do not come with mites. This is ABSOLUTELY NOT TRUE!!!! Packages can come with mites, hive beetles, etc!!! When we installed our new packages, we made sure that we hade a clean West Trap beneath the screened bottom boards. This is used to catch the falling mites so we can get a count. After the bees were settled, but before brood was in the advanced larval stages we vaporized our new packages. Low and behold we had mites dropping off. And not just two or three. We are talking about as many as a few dozen. This is enough mites to “seed” a hive to have huge problems by late summer or very early fall. 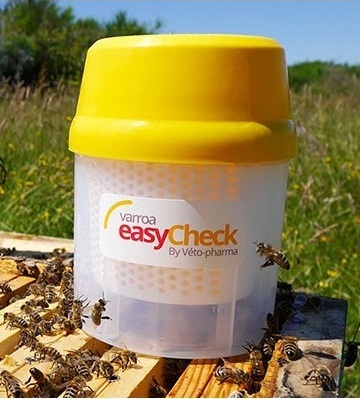 During the summer we tested with our Varroa Easy Check. This is a tool that EVERY beekeeper should own. Testing was done monthly from July through the end of the season. When we found more than three mites per hundred we would dribble with oxalic acid solution. If this did not fix things we would treat with mite away quick strips. Our findings showed that dribble is a poor method of mite treatment as it more of a flash treatment that only has an effect on a few phoretic mites. Mites in the cells and under the capping, which are the vast majority of the mite population in a colony, are unaffected by the treatment. After the summer honey flow, we saw mite levels rise rather rapidly. Meaning our test results were showing doubling or tripling of the mite levels instead of a small increase. This is typical to what researches have found as well so we were disappointed but understood what was happening. We found that dribbling with oxalic acid did nothing to stop this increase so we resorted to mite away quick strips and even Apivar to stop the build up of the mites. After reviewing our records, we lost no hives to the mites in the fall as opposed to 10-20% like last year due to our test and treat methods. We did loose one to a failed queen that we were not able to correct properly during the late summer or early fall. At the time of this writing, our winter losses stand at four hives to mites, queen failures, or a combination of both. We tested the dead bees that were left in between frames and boxes on dead outs and found high levels of mites amongst the dead bees. This should be a recommended procedure to determine colony death cause!!! With these hives dead, our total losses for the year stand at 5 out of 52 or approximately 10%. Of course, we do have some that are a little on the weak side and they could fail. As always, with beekeeping this is a distinct possibility. Mite levels could still be high and cold weather can take its toll. A report on this will have to follow at a later date. Are we happy with our treatment plan? OF COURSE! We have not lost this few bees at this point in the winter in a long time. I am also happy to report that other larger beekeepers that followed similar treatment plans had similar or even better results. Unfortunately, beekeepers that never treated or treated too late are suffering staggering losses. Anywhere from 50% to 100%. This is proof that doing nothing does not work, no matter what beekeeping religion you practice. So, in short, we will be testing and treating as often, if not more often, again in 2018. This we want to try in 2018: Formic Pro. It has a longer shelf life than its predecessor Mite Away Quick Strips which is a huge bonus. Based on the results from people who used Formic Pro in 2017, it looks like it may be a little gentler because it has a longer treatment time with a slower release than Mite Away. We will see how it works out for us. 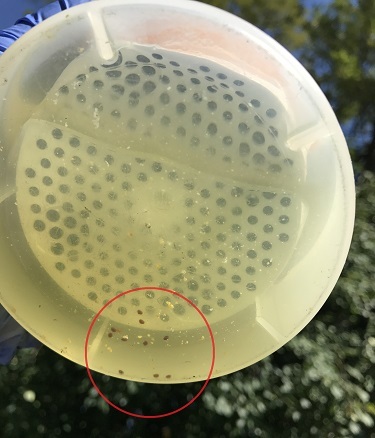 We noticed that areas where beekeepers manage bees in a Laissez Faire manner, there were more mites and many more mite problems despite rigorous treatments. Systemic treatments were necessary to keep the mite population down to a manageable level. This should not have been required, but was required because other beekeepers do not practice good animal husbandry. When one is in charge of livestock they are taking care of the animals from birth until death. Not treating not only hurts the livestock that is owned but in this case, causes great detriment to neighboring livestock and the few feral colonies that are left. Part of being a good neighbor is having good husbandry practices. We all need to be good neighbors! Many people think of bees simply as a summertime nuisance. But these small and hard-working insects actually make it possible for many of our favorite foods to reach your table. From apples to almonds to the pumpkin in our pumpkin pies, we have bees to thank. Depending on an individual’s diet, between one and two thirds of the crops humans use for food production depend on pollination by insects such as bees in some way. Also, the vast majority of wild plant species also require pollination to survive. This valuable service that Mother Nature has provided at no cost for thousands of years, however, is increasingly failing. As an example, after 3000 years of sustainable agriculture, farmers in the Chinese province Sichuan have to pollinate apple flowers themselves by using pollination sticks because of the lack of honey bees to pollinate their crops. These pollination sticks are commonly brushes made of chicken feathers and cigarette filters. This is one small example of a pollination problem occurring world-wide. Closer to home, the California almond crop is critically at risk each year due to the lack of pollinators that are necessary to pollinate the thousands of blossoms that are on each tree. To explain how large the problem is, the 2013 almond crop is approximately 800,000 acres, according to Extension apiculturist Eric Mussen of the UC Davis Department of Entomology. The recommended number of hives or colonies to pollinate the almond crop is two per acre, which means that 1.6 million colonies are needed this year alone. California only has about 500,000 colonies, so over a million need to be brought in from other parts of the United States. Because of heavy honey bee colony losses sustained across the nation over the last few years, beekeepers that provide pollination services are not going to have enough colonies to pollinate the almond crop to full capacity this year. And the almond crop is only one that is at risk. Many fruit and vegetable crops are at risk because of the lack of bees and other pollinator insects. Bees are the most efficient pollinator. It is true that birds, bats, beetles, various types of ants and flies, as well as butterflies can be classified as pollinators. The problem with these pollinators is that they are not designed for the job and do not do it as efficiently as the honey bee. Bees are especially efficient at pollination because their goal in life is to collect pollen and nectar exclusively, as these become their food. To accomplish this, bees visit many flowers of the same species during a single trip and have hairy bodies that easily pick up pollen grains. How Much do Honey Bees Provide to Food Production? In the United States, Honey Bees are required to ensure pollination and help guarantee the production of more than $15 billion crops each year. If you enjoy eating Watermelon, Cantaloupe, Squash, Almonds, Apples, Cherries, Various citrus fruits, and various berry crops such as strawberries and blueberries, you have been enjoying the labor of honeybees. Without bees to pollinate these crops, the blooms would not mature into fruit. Bees provide crops such alfalfa, carrots, canola, and various clovers the ability to ensure that seeds are created to grow the next generation of plants. Remember without the seeds it would be impossible to plant alfalfa or clover to feed to cattle, or grow carrots, peppers, cabbages, and various other vegetables in the garden. Internationally, global food production worth over 200 billion dollars each year relies on the pollination services of honey bees and to a lesser extent other insects. This means that as the honey bee and other pollinator’s populations decline, there will be a direct impact on the stability of food production and consumer prices. It will also mean serious consequences for human health and the food supply. This means that an awful lot rests on the small honey bee. If it were not for honey bees, food production would be very difficult and many of our favorite foods would not exist. Remember to support your local beekeeper. They help to keep our food supply safe.